Every day that goes by, I worry more and more as to whether the new Cinderella Blu-Ray will actually have a new restoration or not? I'm thinking of the time when they re-released The Jungle Book and The Force Awakens, but in 3D. They released 2 great editions, with beautiful covers, and lots of new bonus content. Who knows, maybe they'll do the same for Cinderella. Exactly. I'm hoping for something similar here even if Cinderella wasn't quite the blockbuster that the two movies you mentioned were. And we can't even get confirmation from a trailer since the BATB Signature Edition had Disney Channel advertisements featuring a completely different restoration than what we ended up getting. The criticisms about the inaccurate colors and DNR have been well documented, even by the people at Disney. I've already contacted Disney many times about this. If a new transfer isn't being worked on, I'm going to be furious. The new restoration of Cinderella 1950, as well as the cover art, I can't wait for! A new cover would have been nice, but I do love the poster and I'd prefer the theatrical poster over something new and garish like the animated features tend to get. How do you know there WILL be a new restoration? Where is your evidence? A Disney Movie Club rep has confirmed this on Facebook. Do we have to have a DMC to get it or will it be available to purchase in any store? It'll be available in every store. We just heard of it first from the DMC. Please show me the link to the rep's comments! That's true, at least Cinderella 2015 doesn't get a bad cover. You know, I would love the transformation as Cinderella 1950's Blu-ray, and the storybook in the film as the steelbook cover. Well, it's actually a private conversation I had with her on Facebook, not public. It's that Priscilla Porter person, right? "Are you 100% sure that the Signature Edition will have a brand new transfer? Just making sure one last time,"
"When researching this, we only have the Anniversary Edition available at this time. It does not state it is the Signature Edition. There are no changes with the Anniversary Edition." Well, she told me the following, "We will have a new Cinderella Signature Collection Blu-ray that will be newly restored available for pre-order." There have also been a few other reports of a new restoration being confirmed so it sounds legit. I don't know how much Reel Cinematic is reliable, but they said that Cinderella is getting a new restoration and 4K. 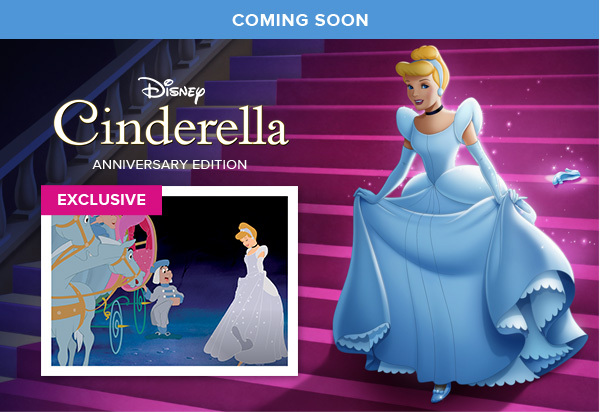 The Disney Movie Club sent an email about the new Cinderella releases and I've never seen the artwork below. Could this perhaps be what the covers will be? OMG THANK YOU, THANK YOU ToyStoryFan!!!!! I have been waiting for some kind of glimpse of cover artwork! I must say I find the first image, for the first film, to be gorgeous. And both artworks are pretty. I have never seen either artwork, and so I would say these are either for the final artwork for the covers or they are preliminary artwork for the covers. I bet they are preliminary, because they are a little off-model, and so I think they will be re-drawn. I think the first one is being used because it mirrors Cinderella running down the stairs on the cover that the live-action film's 4K Ultra HD is getting. Interesting choice of theirs! But Disney....Cinderella's shoes are supposed to have hearts, not bows! This is why I think the covers will be re-drawn. And thanks farerb, I hope it is true the original is also getting the 4K!